The unique and patented friction damper device consists of several steel plates rotating against each other in opposite directions. The steel plates are separated by several shims of friction pad material producing friction with the steel plates. Our dampers provide superior energy dissipation compared to all dampers on the market, due to the patented design and friction material. For any given damper size required, Damptech dampers provide higher damping, minimizing loads on the structure, and reducing shaking and damages due to a storm or earthquake, when compared to other dampers on the market. Peace of mind with no maintenance required: No fluids, No corrosive surfaces, No reduction in friction over multiple earthquakes or storms. This maintenance free protection makes Damptech an economic solution, minimizing costs over a project’s lifetime. Quick and flexible to install: The contractor can adjust length and friction slip force on site if necessary. The client has the ability to adjust the damping in the future if there are changes in building codes, or building use, or expected loads. This flexibility provides security for our clients. Well-proven analysis and established track record: Damptech provides characteristics of the Link element for use in non-linear analysis. This data is supported by 25 years of laboratory testing, patents in all world markets, and 20 years of experience in the field. Projects include the tallest building in Japan and projects in 7 countries. Multiple design models & applications. Capacities from 5 kips to 1125 kips/ 20 to 5000 kN, or more if required by your project. Equally good for new buildings and retrofit. If you want to control vibration, DAMPTECH has a solution. See these movies of the assembly and how our basic T-damper works. 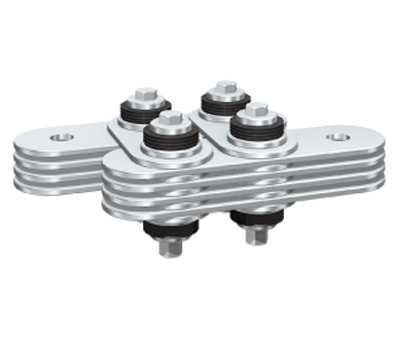 The larger dampers - as the 4J damper (4 joints) shown above, use the same patented technology. When an external force excites a frame structure the girder starts to displace horizontally due to this force. The damper will follow the motion and the central plate will rotate around the hinge. The horizontal plates will rotate in opposite direction to the central plate because of the tensile forces in the bracing elements. When the applied forces are reversed, the plates will rotate in opposite way. During this process the damper is dissipating mechanical energy by means of friction between the sliding surfaces in to thermal energy (heat) and thus minimizing the vibration of the frame structure.